CHROMiX is proud to announce Digital PressWatch, a new Maxwell-powered service. Digital PressWatch was designed within the capable Maxwell cloud service to provide digital printers the kind of QA controls traditional web and sheet-fed printers take for granted. And then go much further. Digital PressWatch provides tools for viewing, monitoring and reporting the performance of each and every digital press.... from a web browser. Essential tasks like verification, pass/fail reporting and trending relative to a print standard are core to its functionality. And.... very exciting to many users, Digital PressWatch has a visual detection "heat map" where a press operator can immediately see if a press has problems and (in most cases) what the problems is! This heat map can be viewed on a monitor or printed. Supporting its value, in a 2008 study, Rochester Institute of Technology (RIT) did a comprehensive study of digital printing, and discovered that the top 3 problems customers complained about concerned print uniformity. Digital PressWatch solves the problem of detecting these issues early in the process. Digital PressWatch is the only early detection system of its kind. Corrected some UI updating issues when selecting measurement files, etc. Curve2 v2.2 is Universal Binary / Mac OS X Lion compatible and Win 7 compatible. Our tests have proven it to be very stable under the new roaring king. Curve2 was represented both at the G7 Summit at GraphExpo and at The Color Management Booth near the IDEAlliance booth and G7 Pavilion area. Version 4 is due out soon and will change things a bit. Look forward to much simpler setup as we move towards our ultimate goal of zero config on the client. John Paul Caponigro recommends ColorThink. basICColor has improved accuracy, repeatibility and inter-instrument agreement of their DISCUS colorimeter device by using advanced calibration methods (a robot that positions each instrument at the exact same place on the reference monitor/light source) plus other improvements. X-Rite is offering i1Display2 and i1Display LT owners a free upgrade to the Mac OS X 10.7 Lion version called i1Profiler D2LionEdition which is compatible only with Apple OSX 10.7. This special edition software has a comparable feature set previously offered in i1Match monitor profiling software. This software will now be available FREE of charge to ALL registered owners, not just to those that purchased in 2011. There was a nominal fee, but is now waived if your device is registered. 3D Printing? : This one may may surprise you! basICColor has a website: that summarizes OS X Lion compatibility with their products. Documentary: Glenn Andrews notes a preview of a not-yet-released documentary on the nature of color perception and subjective factors (including language) that influence how we see things. In the second half of this clip Himba tribsemen from Namibia are tested for color perception. They can easily see insignificant differences between shades of green, but can't see an (to us) obvious difference between green and blue. Thanks to Glenn Andrews for this addition. The science of color management has matured to the point where a novice user can make a dependably good printer profile using any of the software packages available today. But in many cases you have more choices than ever, which can make things confusing if you don't know which options to choose. This article will provide some perspective on what target options are useful and when to use them, tips and tricks to optimize your profile, and we'll watch out for a few pitfalls that still remain in the path to building an accurate printer profile. Say you have an old Epson Rp1280 or some obscure "toner-based-fusion-onto-tile using non-standard colors" printer - or anything that is non-linear and puts out sudden changes in color in an unusual direction. A large patch set is necessary to "capture" the effect of that erratic color blending. Some printers (like modern inkjets) have better native printing, are more linear even before profiling, than they were years ago. It really is not necessary to throw 4000 patches at a device that is well-behaved and already reproduces color smoothly. These printers will not benefit from more patches, and instead might suffer from a lack of smoothness if profiled with a large patch set. Smoothness vs. accuracy. While we may think we want the most accurate profile, sometimes what we really want is the most pleasing profile. 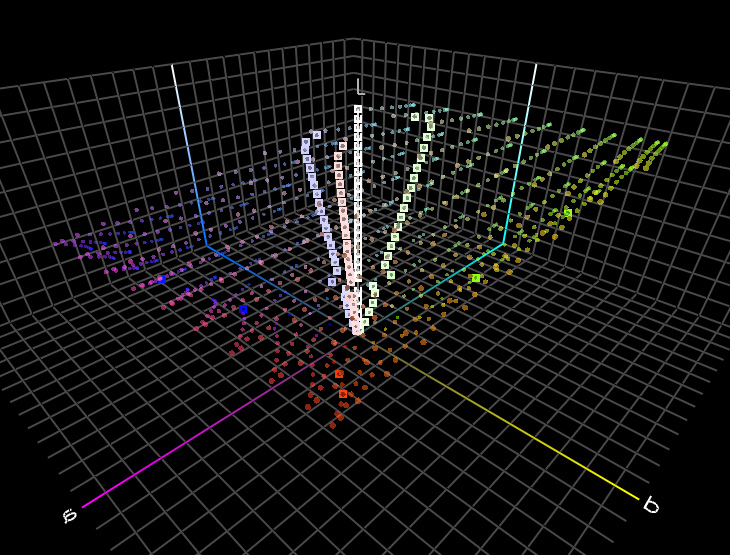 A smaller patch set requires the profile building engine to interpolate more data in-between the measured colors. This will result in smoother transitions. Smoother is better when we want colors in an image to blend smoothly throughout a gradient, from one subtle color to another, without noticeable transitions. I recommend using between 1000 - 2000 patches for most circumstances. If a program makes use of iterative profile tuning, go ahead and follow the recommendations of the software and use fewer patches. However, even the iterative programs I've used seldom improve things if you are using a reasonably large patch set to begin with. Profiling targets can either be arranged so the colored patches are in a kind of progressive order, from one shade to the next - or scrambled (some use the term "chaotified") so that the patches are in a random arrangement. If your printing process has any trouble maintaining consistency across a sheet, then using a randomized target can help you get a more representative profile. An offset press would fall into this category. Any inconsistency in the printing across the page will not end up skewing one color group that happens to be in that location on the page. 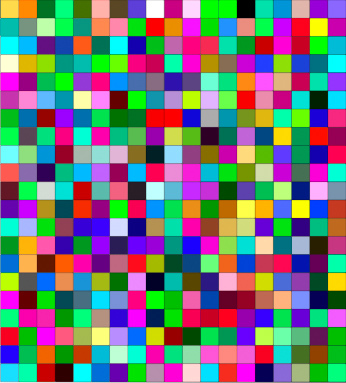 Instead, that inconsistency is spread randomly through the various colors. Spreading fluctuating colors around may not sound like a great idea, but the profile's main purpose is to capture the behavior of the press, and this inconsistent printing is a valid aspect of how the press works. Incidentally, this is also why we like to average several profiling targets throughout a run in order to make a press profile. A visual target has the advantage of being laid out in a visually organized manner. You can see the progression from one color to another. If you get familiar with the visual layout of your target, you can immediately recognize whether the linearity of the printer is smooth or erratic, if a particular ink is not printing, and where key color patches are located (CMYK, max black and paper white.) These can help you spot errors in printing very quickly and easily (and before you waste more time building a profile.) A visual target is generally used only when the printing consistency is very dependable, such as with inkjet printers, silver halide printing and the like. Since our eyes are so discerning when distinguishing between subtle shades of gray, the ability of a profile to accurately reproduce neutrals and near-neutrals is highly valued. 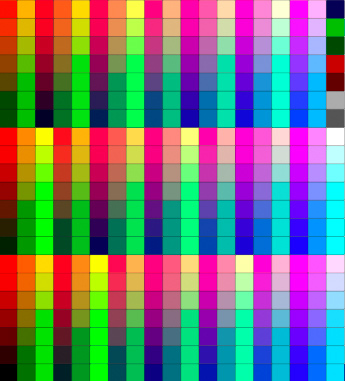 In the past, programs like GretagMacbeth ProfileMaker used targets that specifically included columns of near-neutral patches in order to 'over-sample' this very important part of the color spectrum. Monaco Profiler targets were laid out in a perfectly uniform grid and seemed to manage neutral rendering very well without these extra patches, perhaps because most users used targets that had a higher density of patches overall. The newest entry into this field, X-Rite's i1Profiler, uses a combination of these other two tactics. The target generator in i1Profiler creates colors in an evenly-spaced grid. And it will add near-neutral patches into the target as "filler" patches, depending on the exact patch count of the target. If neutral rendering is particularly important in your work, it would be worthwhile to know this formula and choose the patch count of your targets to make the most of this feature. For example, a 1006-patch RGB target made by i1Profiler has no near-neutral patches, while a 1005-patch target has 99 near neutral patches in three columns surrounding the neutral axis. Ironically, if you are wanting to over-sample these near neutrals, you might end up actually choosing a lower patch total in order for the target generator to create more of them. In order to make a good profile, we want the profiling target to capture the 'raw' state of your printing process. In your RIP, you still need to have your ink limiting and linearization turned on of course (in the RGB world this is handled by choosing your media/paper setting) - but any use of ICC profiles (any color management) must be disabled all along the printing path. This is old news to veterans of color management, but if you are a novice or have inexperienced people printing targets and creating profiles in your organization, it pays to have an easy means to confirm that no color management is left on when printing your profiling targets. If you print with a profile made from a target with color management on, you are basically "double-profiling" and your prints will be desaturated with perhaps a brown or bluish cast - not a good profile at all. There are a couple of easy ways to check your target to verify that color management was indeed turned off when it was printed. With RGB targets, check the 100% yellow patch to see that it contains only yellow ink. If there are droplets of any other inks in there, then that is a clue that something is getting in the printing path and making color decisions. With CMYK prints, find a patch that is supposed to be composed of K (black)-only ink, and check to see that it indeed has only black ink there. (See sidebar) This is another incidence where a visual target comes in handy. But you can also find these patches on a scrambled target by bringing the reference file into Photoshop and using the eyedropper to check the color build of the patches. If you have ColorThink Pro, this task is even easier since you can order the colors in the reference file by color and quickly isolate the strongest yellow, the K-only patches, etc. Some profile building programs offer an option for "size" of profile. No, sorry - this is not a magic button that will make your printer capable of reproducing all the colors of the rainbow. This option is not referring to an increase in the color gamut of your printer, but rather how detailed that profile will be. A larger size might have something like a 33 x 33 x 33 grid so that any sudden transitions or irregular gamuts can be accurately reflected in the profile with more detail. But be careful - a bigger profile size results in a larger file size, and with this setting profiles can be made as large as 10 MB or more. (Try embedding THAT into a jpeg you email to your Uncle Lance.) In general, the normal sized profile will work fine for most uses. And besides the larger file size, there is nothing wrong with making a larger profile. It's great to be part of an industry as it's coming into its maturity. The software that didn't work well is gone and the good software that is still here is still getting better. There are different ways to design a profiling target and more options when building a profile. If we know more about what these choices are intended for, we can make wise decisions which will save us time and effort, and at the same time create profiles in which we can have great confidence.